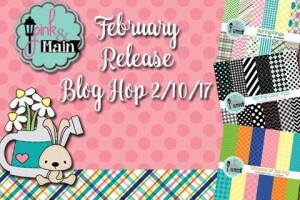 We are celebrating Pink and Main’s February Release with a fun and inspirational blog hop! Be sure to go to the website Pink and Main and check out all the new stamps and dies! And be sure not to miss the brand new paper line that we are very excited to debut… we have 3 new 6×6 paper pads that are perfect for spring and coordinae with each other. Please hop along through all of the design team members’ blogs, and a couple of guest designers’ too. There will be prizes along the way. For my project, I created shaped card with super cute stamp set – Scentsational (and coordinating dies). For background I used white card stock and I die cut it with Scallop Circle Dies, with smalled die I cut smaller flower shape from new patterned paper – from Spring Flings paper pad. All images are stamped with Versa fine onyx black ink and coloured with Kuretake Clean Color Real Brush markers. For final touch I added pink twine. Each blog has a prize to give away, and I am excited to give away Scensational stamp set. To enter the giveaway, just leave a comment here and on every blog in the hop. We will choose random winners from the comments and post them on the Pink and Main blog on the 15th. Here is the lineup for the hop, enjoy! This entry was posted in Pink and Main. I just love the skunks! Awww! What a darling card. I love that it is shaped like a flower! Such a sweet card! The bunnies are my favorite so far, but the skunks are really cute, too! Love the bunnies sweet card! So stinkin cute! Love this stamp set! Great card! I just love that skunk! So cute! Love the card as always Kate. Great job! I love the super sweet paper you used!! The new stamp & die set are Super DUPER cute!! The skunk is way too cute!! 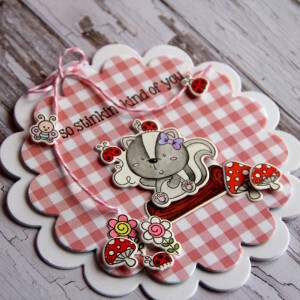 I am a hug fan of shaped card as well as shaker cards. I forgot to mention that I love the pretty bow too! So so cute! 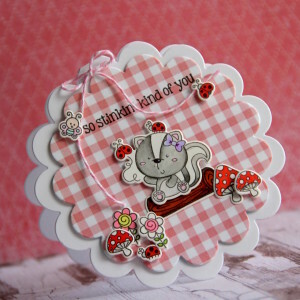 Love this stamp set and your adorable card! Way to think out of the box…super cute shaped card! Absolutely adorable card! I love the scalloped shape and that plaid paper you used! The little skunk is so super cute! That scene you created looks so amazing! So adorable and I love that you made a shaped card! Wow, such a sweet card! Loving the new release! Love the pink patterned paper and card shape– more dies to buy! So cute. A scalloped card – What a great idea! I am going to borrow your idea to make gift cards. Love this unique card design. Love your adorable and creative card. OH goodness! this scallop shape card is the cutest!!! Kate, your card is just darling!! The scallop shape is perfect!! Amazing job, my friend!! Such a cute shaped card. Super cute card!! Love those images!! So cute! I love the little scene you created! Your card is so cute! I really like that you made it a circular card. Adorable card!! Thanks for the inspiration!! Beautiful card! Love the shape and design! Oh my gosh, this is so adorable. Love the gingham paper background. Love the shape of this cute card! I love everything about your card…from the card shape to the paper and stamp set! Adorable! Thanks for the inspiration and for the opportunity to win! Love the card! The skunks are too funny. Oh my!!! Such adorable card!!! Too cute!!! Love those stamps. Nice card, very creative. Super cute! 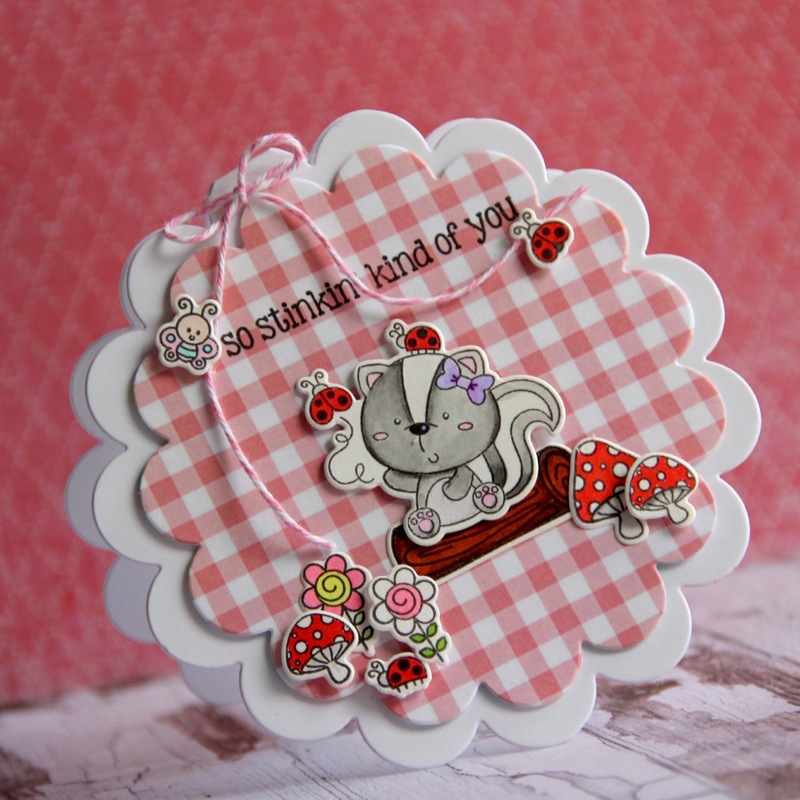 I love the little flowers and critters you have sprinkled around the perimeter of your card! What a fun shaped card! And the skunk is so adorable!! It is always fun to see different styles of cards, this one is adorable! I love the shape of this card and the dimension! What a cute card and sentiment! I have to get this stamp set and make this ! It is so cute! So cute! Love the shape! I’ve never made a shaped card but you’ve inspired me to have a go at it! This is so darling! So cute! Love the scallop circle base.